A good looking and well made highly decorative pair, ideal for storage, fantastic to have a matching pair, they would sit very nicely either side of a fire place. There is around 50-100 high definition super-sized pictures at the bottom of this page. Item condition Sun - Closed. Sat 11 till 5pm. Working hours. Parcels may be left with a neighbour where appropriate. 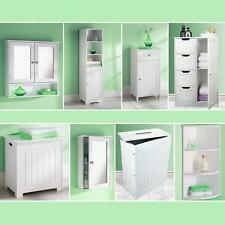 Luxury Three Door Stainless Steel Mirrored Bathroom Cabinet. Super Shiny 304 Stainless Steel Cabinet. Super Shiny Highly Polished Pre-assembled Cabinet. W: 60cm H: 104cm D: 31cm. Gloss white finish. If there's a problem, just let us know and we will fix it. 2 levels of storage space. 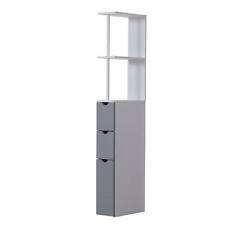 PLASTIC STORAGE CABINET WITH PARTITION. 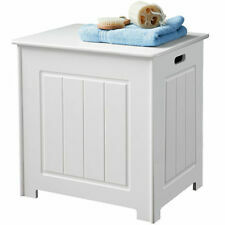 Easy assembly,plastic construction,ideal for outdoor storage. 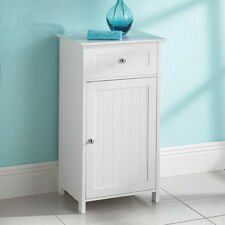 FRESH WHITE FINISH: Blends in beautifully with all style décor.|SPACIOUS: Features a bottom cabinet with an adjustable shelf, an open top shelf and a large surface top.|TWO RAISED FEET: Helps to prevent any daily wear and tear. 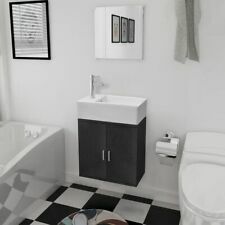 Also keeps cabinet dry from any water on the floor.|STURDY CONSTRUCTION: Made from a blend of premium quality MDF and particle board for durability and reliability.|LOW MAINTENANCE: Smooth surface is easy to clean and keep looking fresh. DIMENSIONS: 90H x 40W x 30Dcm. MAXIMUM WEIGHT CAPACITY 50KG. ASSEMBLY REQUIRED.